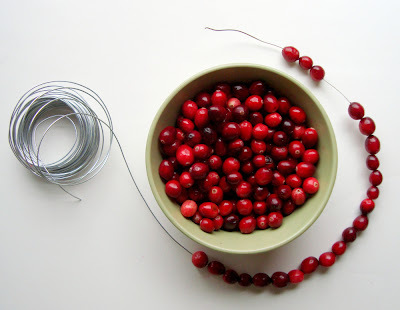 Do you know about the simple magic of cranberries and wire? I certainly didn't until my good friend, Kathrin, told me about the little ornaments she was making with just those two materials. We had to try it. My daughter whipped up a little heart, and said "this is easy!" in that confident, happy way that an almost 5 year old speaks. 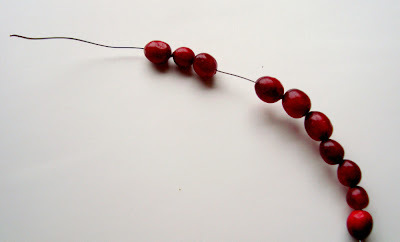 Each cranberry glides on, and the wire is stiffer than the traditional thread and needle. The combination of the rigidity and flexibility of the wire is what makes this so interesting even after the stringing is done... you can make hearts, rings, initials, etc. Wire ends are sharp... fabulous for piercing berries, but care should be taken if done with young children. p.s. Did you check out the delicious recipes in Monday's comment section? Mmmmm! What a wonderfully simple idea. Thanks for sharing! what a treat to see ...the finished pieces so modern looking. You should check out Heidi's cranberries on 101 Cookbooks! You'll love them. great idea... but, do they go bad after awhile? I never thought about using wire. Wonderful! These are temporary, that's true. I plan on just plucking them off into the compost bin when the holiday is over. The wreath is outside, where below zero temps will keep it nicely frozen. What a great holiday activity and treat all in one! Thanks for the idea! Clever! 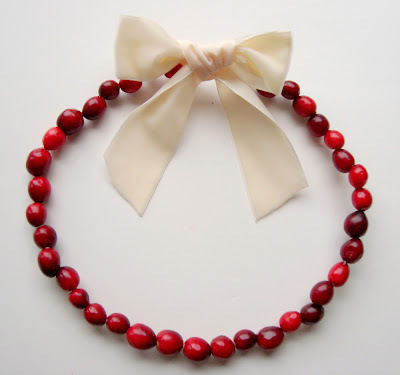 I've made cranberry garlands with a needle and thread, but this is even better! oh la la! the possibilities are endless! love this cranberry idea. 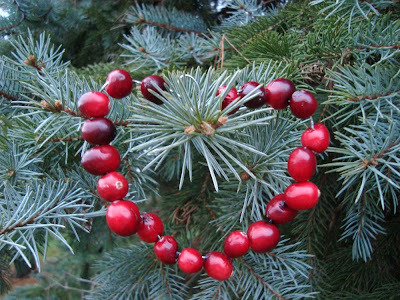 love the red berries in the winter. thanks. So lovely. I was just thinking about cranberries yesterday, but I wouldn't have thought of wire. Thanks for your simple inspirations. I really like this idea! Our 4-H club always does threading cranberries with popcorn at a craft show for the little kids to do to make the day a bit more exciting for them :) I think that this would be more fun, and unique, than the regular way! Cranberries are a must at Christmas time. I have never thought of using wire; thanks for passing along your friend's tip. I especially like how you paired it with an ivory ribbon. Simply beautiful. Thanks so much for this post. What a great, simple and inexpensive idea! So beautiful! I'll be linking tomorrow! I like these cranberry and wire designs. Wonder if they'd keep for a while if you put a light layer of varnish on? Or even clear nail polish? So wonderful idea! In my country there are a lot of these berries, here in France I miss it so much!.. Simply beauty at it's best!